As computer systems have become more complex and mission-critical, it is imperative for systems engineers and researchers to have metrics for a system's dependability, reliability, availability, and serviceability. Dependability benchmarks are useful for guiding development efforts for system providers, acquisition choices of system purchasers, and evaluations of new concepts by researchers in academia and industry. This book gathers together all dependability benchmarks developed to date by industry and academia and explains the various principles and concepts of dependability benchmarking. It collects the expert knowledge of DBench, a research project funded by the European Union, and the IFIP Special Interest Group on Dependability Benchmarking, to shed light on this important area. It also provides a large panorama of examples and recommendations for defining dependability benchmarks. 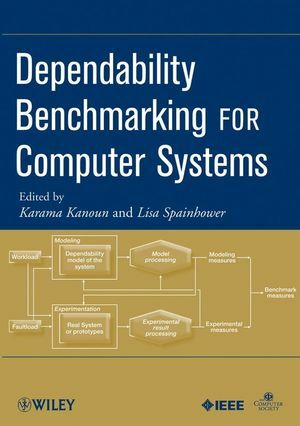 Dependability Benchmarking for Computer Systems includes contributions from a credible mix of industrial and academic sources: IBM, Intel, Microsoft, Sun Microsystems, Critical Software, Carnegie Mellon University, LAAS-CNRS, Technical University of Valencia, University of Coimbra, and University of Illinois. It is an invaluable resource for engineers, researchers, system vendors, system purchasers, computer industry consultants, and system integrators. Karama Kanoun is Directeur de Recherche at LAAS-CNRS, France. Her research interests include the modeling and evaluation of computer system dependability. She was the principal investigator for the DBench (Dependability Benchmarking) European project, and has been a consultant for the European Space Agency, Ansaldo Trasporti, and the International Telecommunication Union. Kanoun is vice-chair of the IFIP WG 10.4 on Dependable Computing and Fault Tolerance and chairs its SIG on Dependability Benchmarking. She also chairs the French SEE Technical Committee on Trustworthy Computer Systems. Lisa Spainhower is an IBM Distinguished Engineer in the System Design organization of Systems and Technology Group (STG). STG designs and develops IBM's semiconductor technology, ranging from small x86-based servers to clusters of mainframes, operating systems, and storage subsystems. She is also a member of the IBM Academy of Technology,?IEEE, IEEE Computer Society, and the Technical Committee on Fault-Tolerant Computing Executive Committee. Spainhower is vice-chair of the IFIP WG 10.4 SIG on Dependability Benchmarking.